Cochrane Nissan is your brand new Nissan dealership in Cochrane, Alberta. We have a unique selection of new and quality used vehicles for you to choose from, including favourites such as the Nissan Qashqai and Titan. We also offer a “Service So Good You’ll Tell Your Friends”, this is an outstanding vehicle service that will help keep your vehicle running for years to come. Cochrane Nissan services customers in Cochrane, Airdrie, Canmore, Banff and Southern Alberta areas. 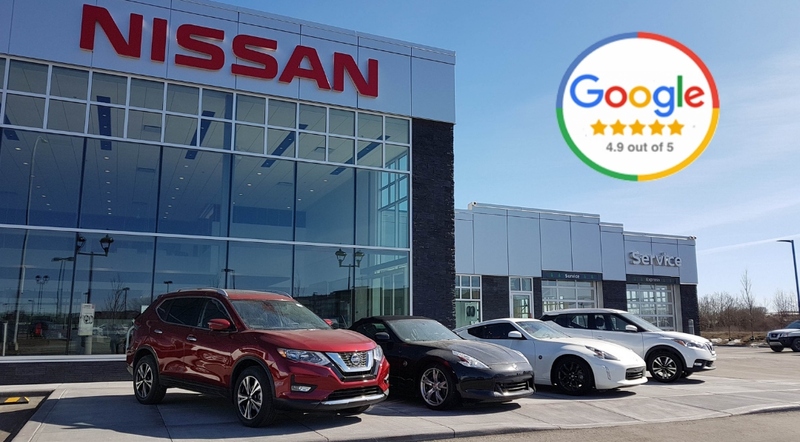 Cochrane Nissan is grateful to have achieved a 4.9 out of 5 rating from our Google Reviews! We appreciate your feedback and are proud to be a part of and serve this community! Come to Cochrane Nissan for Service So Good You’ll Tell Your Friends! We look forward to helping you! At Cochrane Nissan we pride ourselves in having a relaxing and informative process during your sales or service experience! From having a huge vehicle inventory displayed on 4 acres in a new state-of-the-art facility to being able to go on a test drive outside of the busy city streets, you will find out that the Service is So Good You Will Tell Your Friends. Take the 15 minute drive down to the all-new Cochrane Nissan! Watch your vehicle being worked on through our open concept service department. Enjoy one of our two customer lounges or take the time to configure and price your next vehicle all by yourself at one of our six customer stations. Move freely over to our digital customization wall and have a look at all our enticing accessories that you can configure all on your own. We will always be here to help as much as you need but we truly value your time as much as you do! Come stop by and see why we will be the #1 Nissan dealer in the Southern Alberta area! At Cochrane Nissan we really do give you the ability to direct the process to how you want it to happen. Start with a no obligation trade-in appraisal, where with the most up-to-date software we will demonstrate how we arrive at the value of your trade-in using real vehicles being sold in our area for comparison. The most important thing is that we openly share this comparison information with you on what we will sell it for, what we will pay for it and even what we plan to make on it when we sell it. With Cochrane Nissan being completely transparent about the trade-in process, you can decide what is best for you and your specific situation. Definitely come spend some time with our trained product advisors as we pride ourselves on having a fantastic staff that excel in customer service! Our team spends weeks being trained prior to even seeing a customer to ensure they can give you all the answers you are looking for. With our massive new vehicle inventory being displayed on a beautiful 4 acres of land, we are sure to have what you are looking for. Take a look at some of our popular vehicle models, like the Nissan Rogue or Murano, and decide which vehicle is perfect for you and your lifestyle. So come on down for a relaxing test drive on one of our scenic routes at Cochrane Nissan! Our Nissan dealership is intentionally located in the beautiful town of Cochrane because it has a lot to offer. And whether you are from Cochrane or any of its surrounding towns or cities, you will enjoy to drive here! We hope you will choose to make us your trusted Nissan dealership!